In Thailand, I was warned before we went, the sun is very strong but it hides behind clouds. 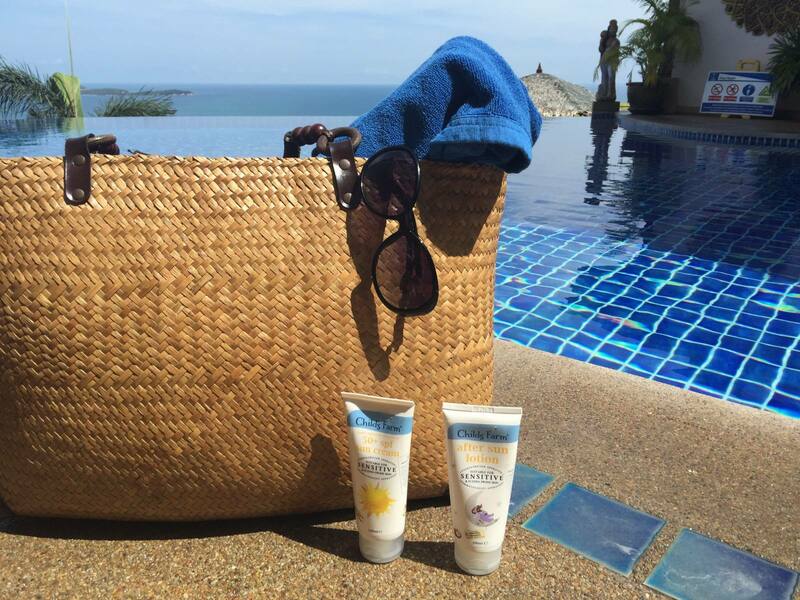 The advice continued that you must wear sunscreen every day, and reapply much more regularly than you would at home. So I was happy to try Childs Farm sun care for the boys while we were there.
. I was sent Childs Farm 3 in 1 wash and Childs Farm SPF 50+ sunscreen and Childs Farm after sun for the purposes of this review. The first thing to note about Childs Farm sunscreen (rrp £10.99) is it is a thick white cream. It doesn’t rub in easily, and a little seems to go a long way. Noah began our holiday enthusiastically rubbing it in on his arms and happily enjoyed having it applied to his face. After a few days of that he was done and we had to pin him down for an application of sun cream! I’m confident that would have happened with any sun protection, and wasn’t a problem caused by the Childs Farm spf 50+! Apparently one of the main reasons that it might be difficult to rub in is that it relies on titanium oxide to create a physical barrier to the sun, rather than containing avobenzone which is a chemical barrier, but also a known allergen. Because of this Childs Farm SPF 50+ is an effective sunscreen that’s also skin friendly. Noah suffers from really dry skin on his torso, and this cream was really good to make sure his skin was protected and moisturised, without causing further irritation. I love the fact that this is a water resistant sun cream, too, because James jumps in and out of the pool so often it would be a huge pain to have to reapply after every splash! 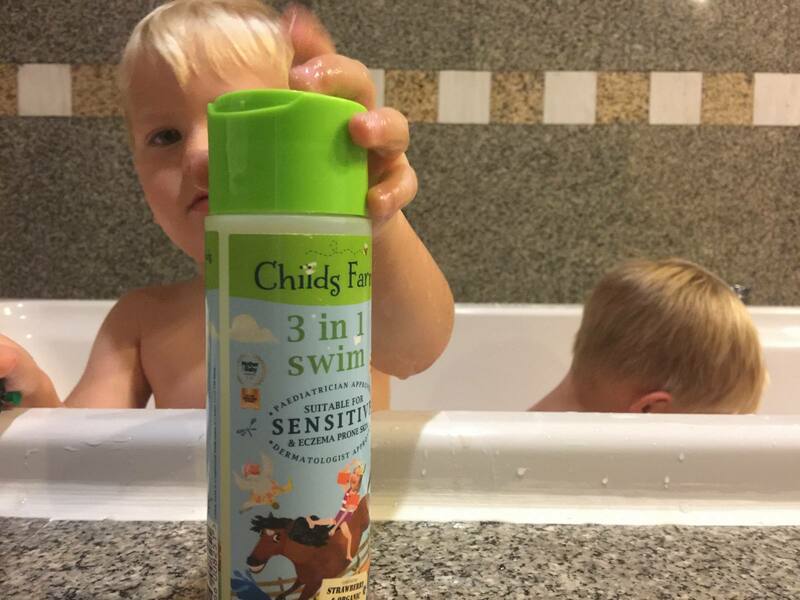 After our time in the sun and pool, the boys enjoyed a bath with Childs Farm 3-in-1 Swim bath stuff (rrp £2.99). The baths in Thailand – in the hotels we stayed in – were all deep, with steps to climb in. The boys love a splash in the bath whatever country they’re in, and Thailand baths were particularly fun, with both boys taking cars to play with in the tub. The 3in1 wash Childs Farm smells like strawberries and mint, and after the heat of the day with all the sweaty hair that creates, as well as all the swimming the boys were doing, this was a much better smell! Again, there are no nasties in this body and hair wash. I’ve tried shampoo before, for me, without SLS or other chemicals, and found them to be hard to lather or that they gave be dry hair. I didn’t have this problem with this 3in1 body and hair wash.
Then after the bath I’ve covered the boys in after sun (£4.99). Not because the SPF 50+ hasn’t done its job, but just because it smells like lovely coconut! We’ve seen and drank a lot of coconut in Thailand, and so to smell this lovely stuff in the hotel room has been rather nice. I’ve used this on my face, too, and found it to be a gentle and effective moisturiser.